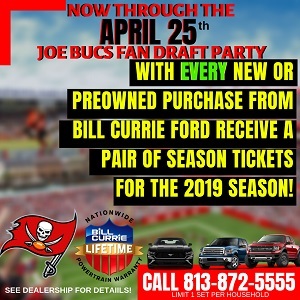 Yes, Bucco Bruce Arians is in charge and everyone at One Buc Palace knows it or will know it. But the new head coach also is incredibly big on delegating. Consider part of the sales pitch he gave to new defensive coordinator Todd Bowles, who explained in the video below. “He let me know I can run whatever I want to run, whether it’s 3-4 or 4-3,” Bowles said as part of his response to Buccaneers.com reporter Casey Phillips asking what lured him to Tampa. That’s a bold statement from Bowles, who is much more careful with is words than Arians. As Joe discussed in the Monday Morning Joe Podcast, it appears clear that Bowles will set the defensive direction after evaluating the roster over the next month, and then advise Arians and Jason Licht of the exact pieces he needs through free agency and the draft. How could it be any other way when you tell your defensive coordinator to run whatever you want? 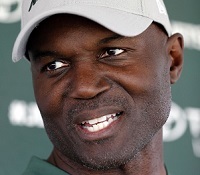 Bowles will wield an awful lot of power at One Buc Palace, it seems, when it comes to fixing the Bucs’ greatest weakness. Its a good idea to let bowles choose the direction instead of telling the d-coordinator to run and build around a certain has been DT!!!!!!!!!!!!! At least the higher ups learned their lesson on that disaster!!!!!!!!!!!!! Or do the sheep just still think that it was a coincidence that the new coach and gm were so non-committal on gmc right out of the gate at the first press conference like they had not already discussed it weeks and weeks ago!!!!!!!!!!!!!!!!! as long as its at least average im good…..
he’s not Rex Ryan but he’ll do! I hope he coaches from the sidelines Joe. I know it works for some, but Coach Smith and Coach Jagazinski just never seemed involved from the booth. We wish him all the luck. Hope he can get it done. If we get a defense we should win a whole lot more games. It’ll be fun to watch. Just don’t get worse. The bar is low, almost bottom of the bay low. Everytime I say it can’t get worse, it gets worse. Just do better than tread water. 30% (ranks 13th) / 25% (ranks 29th). the higher ups did learn their lesson….they didnt allow smitty to have a repeat performance!!!!!! thet learned their lesson and canned smitty as well as dirk!!!!!! “real” fans know this!!!! !…the “sheep” continue to make excuses and find others to blame!!!!!!! the problem has been coaching/scheme not talent/players!!!!!! Missed tackles can wreck any coaches career. No excuses, but if guys don’t make plays, Monte Kiffin wouldn’t have looked so good. monte was able to adjustment and put player in position to be successful…players knew their assignments and knew what they were trying to accomplish…..
Joe I love that plan. Letting Bowles get that #5 pick to find us a true game-changing player for his defense is the most glaring need on this team. It smacks you in the face it’s so glaring. Look at our first right games. 1 turnover…..one friggen turnover? This only happens when you have no playmakers on defense. Our current defense will never be good enough to win in this league. If we use that top pick and find an elite defender we may actually stand a chance. If the Bucs don’t draft defense in April they don’t know what their doing. @813bucboi … “the problem has been coaching/scheme not talent/players!!!!! !” Maybe you’d be content keeping exactly the same roster that went 5-11 these last 2 years, but I’d guess you’re a gang of one right now. Interesting that from your earlier post today, you were willing to give walking papers to DJax, D. Smith, Gholston, GMC & Brate (if they didn’t restructure), Bond, Unrein and yet here you claim that the problem has been coaching/scheme not talent/players!” If it’s all on coaching, why not keep them all? Surely they’d get us to the Super Bowl, wouldn’t they? And interesting that you didn’t mention several players in that group who started a number of games for us last year like Isaiah Johnson, MJ Stewart, Javien Elliott, etc. Do you REALLY want them starting for us again? Actually bucboi, do you even want them as depth players, knowing that sooner or later they’d probably end up starting? funny that 813bucboi was singing a different tune when a certain head coach was around!!!!!!!!!!! Fraud Alert!!!!!!!!!!!!!!!!! ….the answer would be TALENT….the cardinal are more talented than the rams at every position from top to bottom…better players, better offense better defense…coaching is very important but if my guy is better than your guy and wins his one on one match up every time, theres nothing you can do about it except hope to find another match up…GO BUCS!!! the reason why i would send those players packing is because of money…..if all those player were in their 2nd year, then yeah, keep them because up until this point, they havent been developed due to lack of coaching and are still under contract for peanuts…. to answer your second question, yes i would keep the DB’s you named as depth because again, they will finally be receiving proper coaching…..every player on your roster cant be a top 5 1st round pick….but you have to coach them up regardless if they were a 1st rounder or UDFA…..
the question i have for you is, if it wasnt coaching, then why are players not being cut left and right?…..when lovie came in, he gutted the team because we had absolutely 0 talent back then….thats not the case now….why didnt bruce say this is a total rebuild/gut job?…..why did ALL of the previous staff get sent packing? (nagu kept the entire defensive staff for the bears)…..why has only dirk, warhop and monken been able to find a job but the DB coach, QB coach, RB coach, DC all sitting on their couch?…..
button line is, if these coaches had done their job and develop players along with win games they would still be here and not sharing a couch with hue jackson…..
like ive said for the pass 2years, it was coaching/scheme NOT talent/players…..a full house cleaning proves at…..
just excited for this whole FA and Draft process to start already I’m really excited I guess I’ll throw in for another years worth of season tickets ! 😑hope we make it to the playoffs next year ! Rosters turn over by like 1/3 every year. Dumping players to acquire other players doesn’t meant we’re completely devoid of talent. It just means we’re doing what 31 other teams are doing. We have a core of 2-3 o-lineman /QB / WR1-3 / TE that many teams would covet. Top 5 in skill position core once we add a dynamic RB. We have seen Lavonte play at a high level under different coaching and bad levels under other coaching. Same with Kwon. Our CBs looked a lot better when pressing as well – including VHIII. That’s why I lean coaching over talent easily. Most NFL execs seem to say that talent isn’t that different between most NFL teams. That’s why the games are typically all close and go to the 4th quarter. I’ve said all along the Bucs have players just like the 31 other teams do. not see this from Mr. Bowles. And you will see our defense play with fire again. No doubt there will be some tweeking and a couple of additions. But I look for McCoy to play better and the Defense to hold their ground and get some takaways. Sorry…no disrespect intended for anybody including Monte but really? Again NO coaches were needed to get these guys to make tackles…they couldn’t wait. remember if they were that good of a team they would not have failed and only achieved 2 pathetic playoff wins. bucs are the only fanbase that calls has-beens legends other teams would not even remember their names outside of sapp and keyshawn…. there is a reason no one talks about bucs with bears and ravens. there were nowhere in the same league as the Bucs underachievers. not to mention their head coach was able to win with Dilfer dungy the clown was not. there is not a single nfl caliber Oline starter on the entire bucs roster sir… where are these 2 to 3 invisible men you speak of that are keepers? the best lineman marpet is below average 90% and barely average the other 10%… the other lineman could not make a special Olympics roster but on Bucs, they are candidates for the ring of underachievement. dungy’s Superbowl is less than meaningless it took the greatest QB of all time and coaching against one of the dumbest individuals that have walked the face of this earth loving Smith for that clown to win. colts won in spite of dungy not because of dungy. @813bucboi … “when lovie came in, he gutted the team because we had absolutely 0 talent back then….thats not the case now.” Seriously? Lovie got rid of some very good players like Donald Penn & Jeremy Zuttah, then replaced them with players like Collins & Johnson. We’re still recovering from some of the disastrous personnel moves that he made. Our last game against the Falcons included starters such as Elliott & Grimes as our CBs (Ryan went 32-for-45 … 71% completions & 383 yds passing). Bucs offense scored 32 pts, but we lost 34-32. Do you think that MAYBE we might’ve been able to hold them to say 28 pts if our pass defense had been a little better? Nah, it was coaching I know. Thing is bucboi, we were quite healthy in that game, and yet we still gave up 34 pts. Coaching certainly makes a huge difference, but so does talent (or lack of it). Not all NFL teams are equally talented. Bucs have some decent talent (we better have considering that we’re now in the Bottom-5 in terms of CAP space available). Problem is we don’t have enough talent. How many playoff wins without sapp??? No matter how hard others try, tmax always does what he can to keep his title of the biggest buffoon on jbg. Serious LOL at Brooks being a backup or Ronde being an embarrassment. The only embarrassing thing is your severe lack of football knowledge. I have to admit that I am the father of two diehard Patriots fans (to my excuse: Here in Germany you don’t see many teams outside the Pats and the Seahawks – and really, who likes Seattle??). But if two young men – who are forced to watch the Bucs – tell you ‘Dad, why don’t your coaches ever make any adjustments during the game?’ or ‘Funny, your guys sucked the whole game, but when the QB took over in no-huddle-mode you looked really good’ you know for sure there was something wrong with coaching! 2-6 when it matters most…. whose the Buffon now????? you can’t rewrite history because you can’t handle the truth sir.